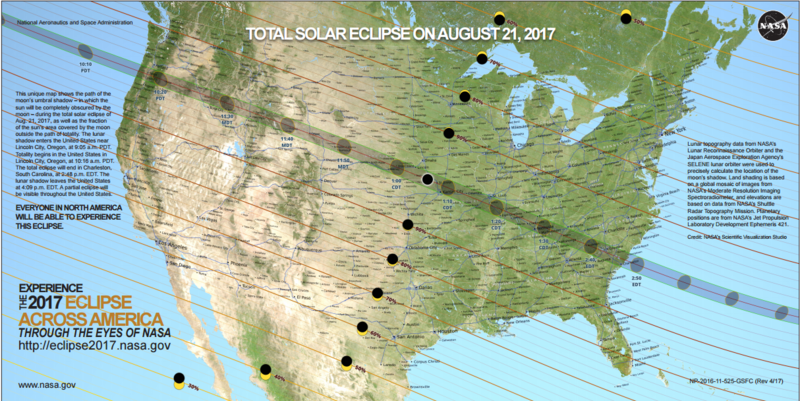 Information on the North American Solar Eclipse that will occur on August 21, 2017. The eclipse begins in the Billings area at 10:21 am. 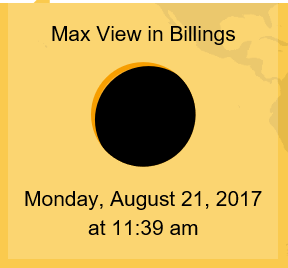 Billings will experience about a 93% obscuration of the sun. Everyone in North America will be able to experience this eclipse! This unique map shows the path of the moon's umbral shadow -- in which the sun will be completely obscured by the moon-- during the total solar eclipse of August 21, 2017. Content for this guide based on Carole Williams' guide and with her permission. 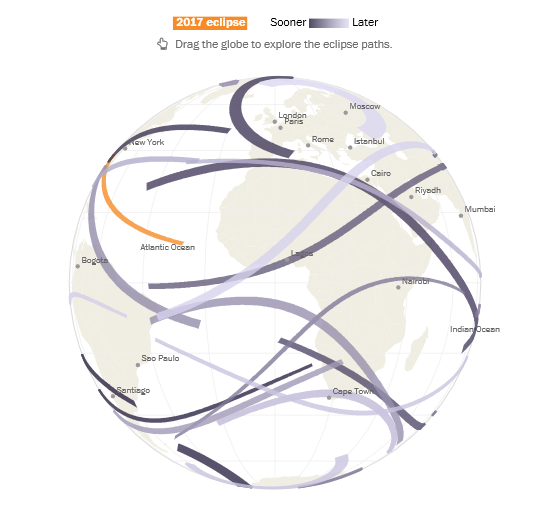 Use this website to see when and where every total solar eclipse will happen during your lifetime by putting in your year of birth. It is never safe to look directly at the sun's rays -- even if the sun is partly obscured. Please take the necessary precautions to keep from harming your eyesight and share this information with you family and friends. You should wear special eclipse glasses or welders goggles at all times. They can be purchased online and are pretty inexpensive. Regular sunglasses are useless. You can also use an indirect viewing method such as a pinhole projection box. Sharing the Skies provides a look at traditional Navajo astronomy, including their constellations and the unique way in which Navajo people view the cosmos and their place within it. In addition, this book offers a comparison of the Navajo astronomy with the Greek (Western) perceptions.